What happens when no one will listen to you when you’ve claimed to be innocent for over eight years? What happens when you lose your job at the Houston Police Department (HPD) based on an alleged cover-up? What happens when you have uncovered key evidence proving your innocence, but the people who can help you restore your name, along with everything you have lost, continue to ignore you? This is what has been happening to Former HPD Officer Katherine Swilley, who the Forward Times featured in a September 2013 article entitled “Breaking the Code of Silence – Former HPD Officer Katherine Swilley, a Victim of Speaking Out.” For over eight years, Swilley has been fighting to restore her name and reputation, in the face of what she alleges is police misconduct, abuse of power, corruption, conspiracy and a serious alleged cover-up. Since publishing the article in 2013, the Forward Times has remained diligently focused on the developments of this case and has uncovered some key information that appears to shed light on what actually led to Swilley’s termination and could prove her claims that she was terminated based off of alleged police misconduct and manipulation of the investigation of her claims by the HPD Internal Affairs Division (IAD). The Forward Times recently received several key pieces of information, including a copy of a letter that was presented to the Greater Houston Coalition for Justice from HPD Executive Asst. Chief of Field Operations Michael Dirden. In that letter, it shows that Executive Asst. Chief Dirden; former HPD Chief Harold Hurtt; then-acting HPD Chief Charles McClelland, who presided over Swilley’s termination appeal hearing, relied on questionable information presented to them that led to their overall decision-making surrounding Swilley’s termination. Based on Chief Dirden’s letter, it would lead one to believe that Chief Hurtt had been fully aware and clear of the basis by which he was disciplining Swilley. It appears, however, that Chief Hurtt may not have been as fully aware of the overall situation involving Swilley as the letter would indicate, based on the questionable information presented to him. Prior to Chief Hurtt making the decision to discipline Swilley, her case was sent to the Administrative Disciplinary Committee (ADC) for review and disciplinary recommendation. It appears there may have been a possible conspiracy to keep Chief Hurtt out of the disciplinary process, which ultimately led to Swilley being disciplined by the police chief. According to the Administrative Disciplinary Committee (ADC) Check Sheet, dated September 4, 2007, Panel C Chairperson J.C. Harding signed off on the document stating that they had reviewed the case and had attended the ADC meeting, along with six out of nine of the other individuals listed on the sheet. All six who were present signed off on the document that they had reviewed the case and were present at the ADC meeting. Something disturbing appears on the document, however. On that same ADC Check Sheet, the words, “Keep The Chief out of This,” are written next to the discipline recommendation section next to Harding’s name, which seemingly gives instructions to whoever was in charge of handling the next steps in the process, and who was in a decision making capacity to do so, to keep HPD Chief Hurtt out of the disciplinary process. This document is extremely important because the ADC reviews cases and makes recommendations to the police chief for discipline, which the police chief usually follows. On Sep. 17, 2007, Chief Hurtt verbally presented Swilley with two charges of “UNTRUTHFULNESS” during her Loudermill hearing. A Loudermill hearing is a termination hearing. No documentation was presented to Swilley at the time of her hearing, proving the relevancy of the two charges. Swilley was required to accept a deal based on false untruthfulness allegations that required her to take 15-day suspension, and drop any and all complaints she may have had with the Equal Employment Opportunity Commission (EEOC), in order to save her job. According to Swilley, when she asked Chief Hurtt who her accusers were and stated that she had not been cited for “UNTRUTHFULNESS,” she was told to take it up with a Hearing Examiner. A Hearing Examiner is someone who hears the cases of officers once they have been suspended or terminated. According to additional documentation, it was later discovered that the IAD report (29409-2007) dated August 20, 2007 from Lieutenant T. A. Horton, the “UNTRUTHFULNESS” charges that Chief Hurtt presented Swilley during her Loudermill hearing had been found “NOT SUSTAINED” 28 days before her Sep. 17th Loudermill hearing with Chief Hurtt. Even though Lt. Horton presented those findings in the IAD report (29409-2007) on August 20, 2007, and recommended that the “TRUTHFULNESS” allegation against Swilley be classified as “NOT SUSTAINED,” Swilley was still suspended and later terminated based on the same alleged “UNTRUTHFULNESS” charges that had been found to be “NOT SUSTAINED” by Lt. Horton a little less than a month prior. The Forward Times was able to obtain copies of Swilley’s official transcripts from her termination appeal hearing, which show a Sgt. Marsha Todd and a Lt. Siscoe attempting to present questionable evidence to, during her hearing on May 29, 2008. According to the documents, after being questioned by the Hearing Examiner (Dole) about Swilley’s case, Sgt. Todd and Lt. Siscoe were forced to admit that Swilley was terminated on a previous 15-day discipline that was concluded in September 2007, under IAD issue record number (29409-2007), versus the complaint Swilley was on record as being terminated for in March 2008, under a different IAD issue number (30819-2007). By a preponderance of the evidence, HPD must show the truth of the charges being levied at an officer, and must prove that just cause exists for the imposition of recommended discipline, if any. This means that HPD must prove, more likely than not, that the officer acted as the department claims. After having this questionable information presented to the Hearing Examiner, Swilley’s appeal was dismissed without giving a detail analysis of the Hearing Examiner’s findings in her appeal. There are other disparities that appear to exist within HPD, that show a lack of consistency in how HPD officers have been disciplined within the organization and allowed to keep their jobs. Officers like HPD Officer Jose Coronado who was drunk when he shot two unarmed men, killing one of them September 19, 2011, while being under the influence of alcohol. Officer Coronado was not disciplined for the shooting, and was allowed to keep his job. He was suspended for only 30 days for acting in an official capacity while drinking, and for using an unauthorized firearm. He was charged with being under the influence of alcohol, which is a violation of department policies No. 300-28 and No. 400-05, carrying a weapon while under the influence of alcohol, as well as several other department violations. In September 2013, four White HPD officers were suspended for violating department policy after listing one another as witnesses on traffic tickets to help themselves get overtime pay for testifying in court. The four HPD officers that were suspended in that ticket writing scheme to earn overtime pay, had collected nearly $1 million in overtime pay since 2008. On Sep. 4, 2012, after concluding a lengthy investigation by HPD internal affairs, then-HPD police chief McClelland handed out punishments to those officers ranging from 20-45 days off without pay. Chief McClelland agreed not to fire the four White officers in hopes of salvaging their careers. Captain Dewayne Ready, who was Swilley’s captain at the time she was being investigated, received a 90-day suspension for operating his security business out of Public Affairs on duty, in what’s called “double dipping” using his city computer, police records, and using thirty on duty police officers to work his security business on duty. There are several other incidents that don’t pass the smell test and raise the question as to how a highly decorated officer like Swilley could be terminated after filing an EEOC complaint, and having questionable charges brought up against her, when other officers keep their jobs. How could HPD justify NOT terminating Officer Coronado, Captain Ready and the four officers involved in the ticket writing scheme, but terminate Swilley when evidence from HPD internal affairs investigators show she was innocent and terminated for the wrong reason? As we previously reported, Swilley was a highly decorated and well-respected HPD officer, who served the City of Houston for over 20 years. Swilley received numerous “Outstanding” performance ratings and commendations from the public, her superiors and from two former Houston mayors. Swilley’s community service work led to City of Houston Mayor Bill White awarding her with the City of Houston’s prestigious Bravo Award in September 2005. In 2008, Swilley’s problems began when she reported what she believed was discrimination within the Houston Police Department’s Public Affairs Division, due to her supervisors’ lack of support for the inner city delinquency prevention program that served at risk youth. Swilley filed a complaint with the Equal Employment Opportunity Commission (EEOC) and she states that as soon as that happened, HPD opened up a criminal investigation on her for misappropriating funds from the youth programs. The Harris County D.A.’s office cleared Swilley of criminal wrongdoing for lack of facts. Swilley stands by her findings that she was terminated as a result of police misconduct and manipulated investigations, after she revoked her willingness to be bound by a “Last-Chance” Compromise Waiver Agreement that required her to vacate and relinquish the rights guaranteed to her by the Civil Rights Act of 1964, which was unlawful retaliation. By signing a “Last Chance” Compromise Waiver Agreement, it gives an officer the ability to accept a lesser discipline as long as they drop any discrimination complaints they may have filed with the EEOC, or have any other pending civil suits. Swilley states her case is not an isolated one, and says HPD records show that HPD officers who have agreed to the terms of the “Last-Chance” Compromise Waiver Agreement have had to vacate and relinquish their civil rights but were rarely terminated, if at all. 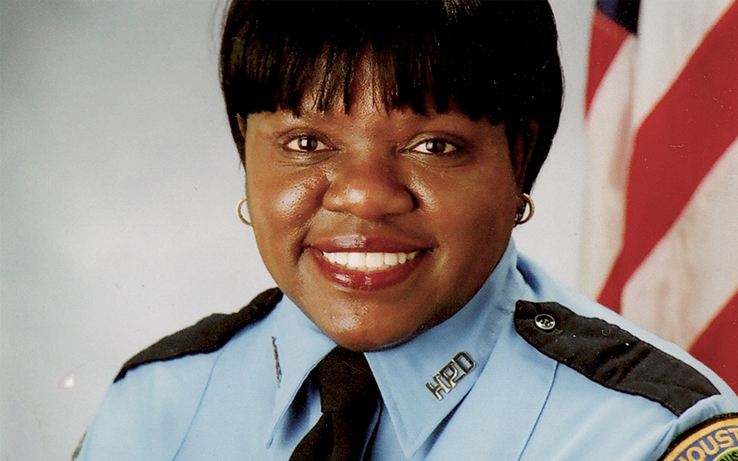 She says that HPD officers who have refused to be bound by the terms in the “Last Change” Compromise Waivers Agreements have been terminated and issued erroneous dishonorable discharges based on unsubstantiated allegations, and trumped-up untruthfulness and/or insubordination charges, which has unceremoniously ended their law enforcement careers. Swilley is hoping newly elected Mayor Sylvester Turner, newly-appointed interim police chief Martha Montalvo and members of Houston’s city council open an investigation into the alleged police misconduct in her case, and work to create a safe place for HPD officers to report police misconduct against fellow officers without being retaliated against or without having to file lawsuits to clear their name, like she has had to endure.